Looking for Address-Proof Affidavit online? 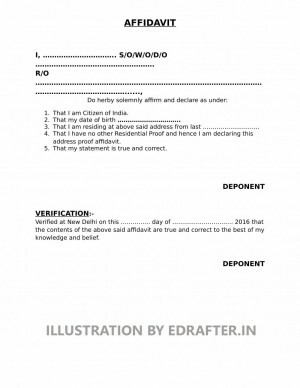 Now get your Affidavit executed on e-stamp paper in just few steps! Affidavit is a written Statement in which Deponent oath or Affirmation his/her Statement. Just like earlier people used to take oath in front of god OR also we can consider the example of Courts by taking swear of Bhagwat Geeta. Affidavit generally states that everything is true and correct and affiant sign the Affidavit by taking an Oath. Address Proof Affidavit is a residence proof affidavit can be used by the applicant as a proof of address when there is no other address proof left with the applicant. Date of Birth of Applicant. Full Address of which the Applicant is making Affidavit. Duration from which the Applicant is residing at the concerned address. For Vehicle Registration – The Applicant can provide the Address Proof Affidavit as a Document acceptance for address proof for the vehicle registration. For Driving License – The Address Proof Affidavit can be used by applicant in order to apply for the Driving License and it will consider as a valid address proof. For Bank Account – The Affidavit can be used as a proof of residence for opening the Bank Account. For Passport – The Address Proof Affidavit might be use for Passport as well but it depends upon the Department that whether they will accept it or not, generally they demand for the Registered Rent Agreement as a supportive Document for Address Proof. For SIM Cards – Address Proof Affidavit can be use to apply for sim card as well. 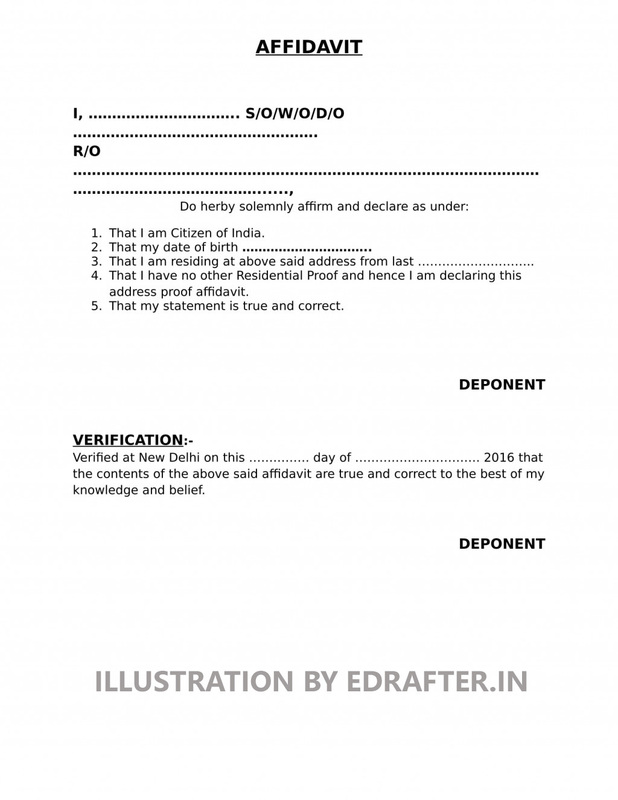 How to Get Address Proof Affidavit Online? Now no more visits to the Court, You can get your duly Notarized Affidavit by just sitting at your home. STEP 1 – At our Legal Documents Menu, Select Affidavit – General Affidavit. STEP 2 – Select Address Proof Affidavit and Fill the provided Form (designed securely to capture your data). STEP 3 – Review the Details filled in the Form and if Satisfy, Click on Add to Cart and Place the Order. STEP 4 – We will quickly draft the Affidavit as per the details you filled in the Form and will send it to your registered e-mail address first for your review and once you Approve we print it on relevant Stamp paper, Make it Notarize and Deliver it to you within 1 day. That’s it! By going through these few Steps, you will get your Notarized Address Proof Affidavit right at your place.